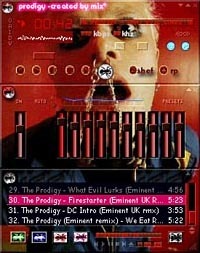 Download Prodigy themed skins for WinAmp 2.0 music player. 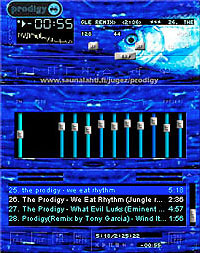 This is the largest collection of Prodigy WinAmp skins in the net! What are WinAmp and skins? WinAmp was the most popular MP3 player in the world, and one of the reasons for its success was its flexibility - for example you can easily add plug-ins to it, or change its layout. 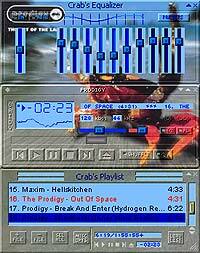 Winamp 2.0 was released on September 8, 1998. 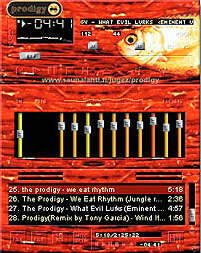 The 2.x versions were widely used and made Winamp one of the most downloaded Windows applications. By 2000, Winamp had over 25 million registered users. 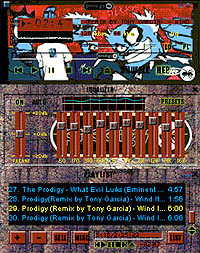 WinAmp Skins are picture packages with which you can change the outlook of the player.
. Download the zip file containing the skin.
. Press Alt+S to bring up the Select Skin dialog.
. Select prodigy in the list of skins, and press OK.